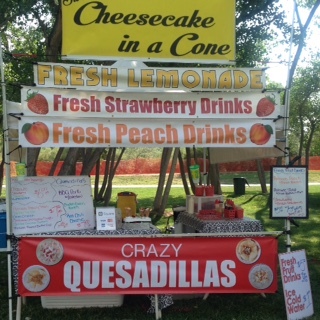 Hi Jayne, Just thought you would like to see the banners on the booth from this weekends event (The Palisade Colorado Peach Festival). You are AMAZING!! Thank you for sharing your photos with us! The booth looks great! If you're interested in learning more about the festival, visit the Palisade Peach Festival's website. If you need custom banners for your booth, visit our vinyl banners page. You can customize a template in our online designer, upload your own print ready artwork files, or work with one of our graphic designers. Our standard production time is two business days, and we ship nationwide.